The Princess Royal has officially launched a new book about the “important” contribution of Scots in London during the First World War. She said she was delighted to be the patron of the Scots in Great War London Group and help ensure that the stories of ordinary people were told. 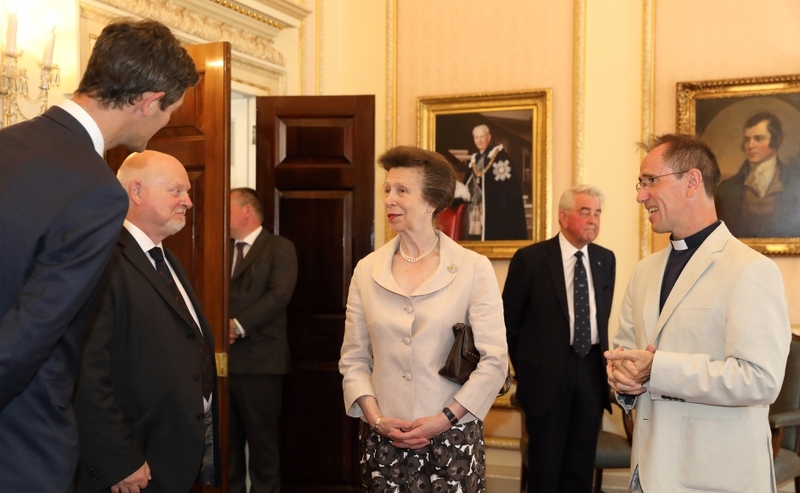 Princess Anne enjoys the company of London Kirk ministers, Rev Philip Majcher of Crown Court Church and Rev Angus MacLeod of St Columba's Church. Monica Wells. The book, entitled Scots in Great War London - a community at home and on the front line 1914-1919, was commissioned to mark the centenary of the end of the conflict. 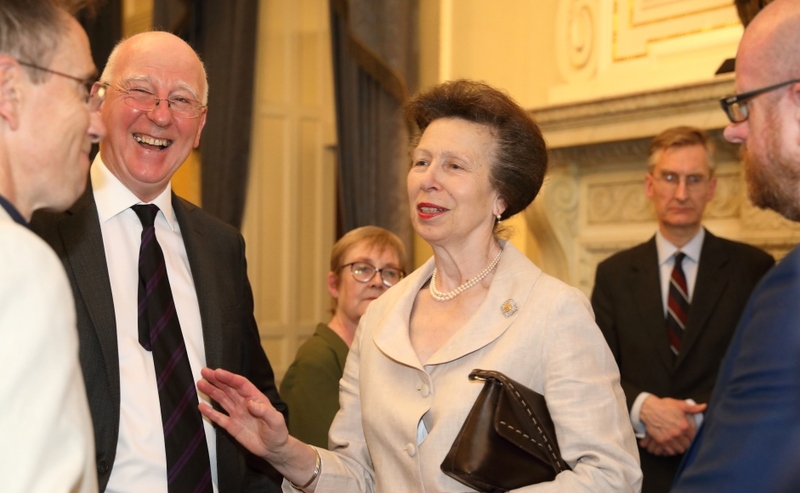 Speaking at a reception at the Caledonian Club in central London, Princess Anne said she recognised that it was a labour of love for the 10 organisations, including the Church of Scotland, that contributed to it. A chapter is dedicated to the little known story of St Columba’s Church of Scotland in Knightsbridge which provided hospitality to 50,000 Scottish troops either on their way home or to the Western Front between 1915-1919. Volunteers would wait at Victoria Station for trains and direct Scottish troops towards the church on Pont Street. They were fed, given time to rest and sometimes put up for the night before being piped back to stations to continue on their way. This extraordinary effort, led largely by women at the church, has not been fully described or recognised until now. Troops enjoy the hospitality of Church of Scotland members in London a century ago. St Columba's Church. Princess Anne said: “The role that those organisations played in the Great War is a story that needs to be told and this book does exactly that. “Their members made an important contribution to Britain’s war effort. “Tens, perhaps hundreds of thousands of Scots, came through London during 1914-19 on their way to and from the Front. “And were fed, watered, housed and counselled and succoured by their exiled countrymen in London. “These are not dry-as-dust tales of the long forgotten. Princess Anne and Dr Stuart Steele, an elder at St Columba's Church whose mother provided hospitality to troops during the Great War. 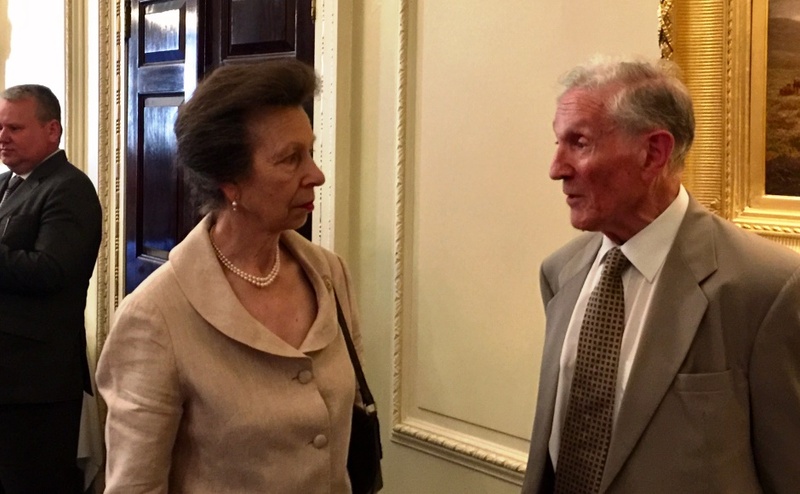 Princess Anne spent time speaking with Dr Stuart Steele whose mother, Peggy Leonard, was a member of St Columba’s Church a century ago. He showed her a photograph of her which adorns the front cover of the book. Dr Steele said Princess Anne was fascinated to meet someone with a living connection to the story. “My mother joined the church the year before the war and became involved in the work with the troops when it began, he explained. “One of the things she always said she did was write letters for individual soldiers to be sent to their homes. “Apart from the hospitality and entertainment offered, the volunteers worked very hard at sorting out problems with paybooks and things like that. Rev Angus MacLeod, minister at St Columba’s Church whose family hail from the Isle of Skye, said the story of the church's hospitality to visiting Scottish troops is remarkable and moving. “It highlights themes that linked people one hundred years ago - hospitality, friendship, the meeting of need and giving of comfort, the offering of prayer,” he added. “It inspires those same things today." 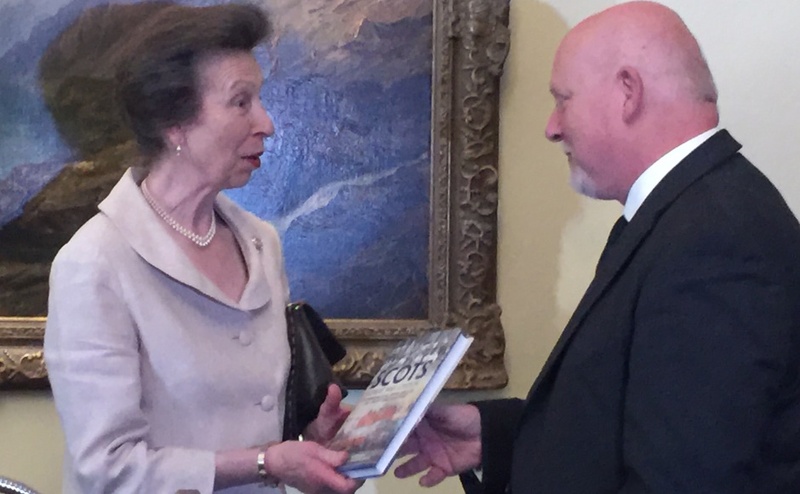 Princess Anne is presented with a copy of the book by Paul McFarland of London Scottish Rugby. Mr MacLeod said church members were very enthusiastic about the project, which was inspired by articles in the church magazine a century ago. It published a regular column titled Soldiers on Furlough and was soon able to boast that “there was no Scottish battalion in France where St Columba’s was unknown”. Mr MacLeod said: "In addition to the inspiring response of the congregation there are stories of church members, most prominent among them, Field Marshal Douglas Haig. "Perhaps the most well known general of World War 1, he dedicated the post-war years to the foundation of the Royal British Legion and the care of veterans. "He was ordained as an elder at St Columba's after the war and his body lay in state in the church for three days before his official state funeral at Westminster Abbey and eventual burial in the ruins of Dryburgh Abbey." Scottish troops enjoying much needed rest time at St Columba's Church. St Columba's Church. A stage play that tells the story of Feeding the 50,000, starring well known actors who have appeared in Downton Abbey and Game of Thrones, is being held at St Columba's Church on October 20. Scottish theatre group, Hopscotch, are staging a production of This is My Life, which tells the story of the challenges faced by armed forces children today, at the church on October 18. Around 1,000 local school children are expected to attend two performances. Rev Angus MacLeod introduces Princess Anne to book authors - Elder Hugh Pym wrote the chapter on Feeding the 50,000. Monica Wells. The book, which was launched on Tuesday, recounts stories of members killed in action, including those from Crown Court Church of Scotland in Covent Garden. Lord Kinnaird, an early star of football in England, was a member at Crown Court and lost two sons during the war. Three quarters of the 60 players who turned out for London Scottish in the last matches before the outbreak never returned. The London Scottish Regiment was the first territorial unit to see action, having been thrown into battle near Ypres in Belgium in October 1914. St Columba's Church members - Rev Andrea Price, Associate Minister, Dr Stuart Steele, Elder, Administrator Lucy Llewellyn, Session Clerk Charlotte Bradford and Elder Susan Pym. Its soldiers included many members of Scottish churches and clubs in London. 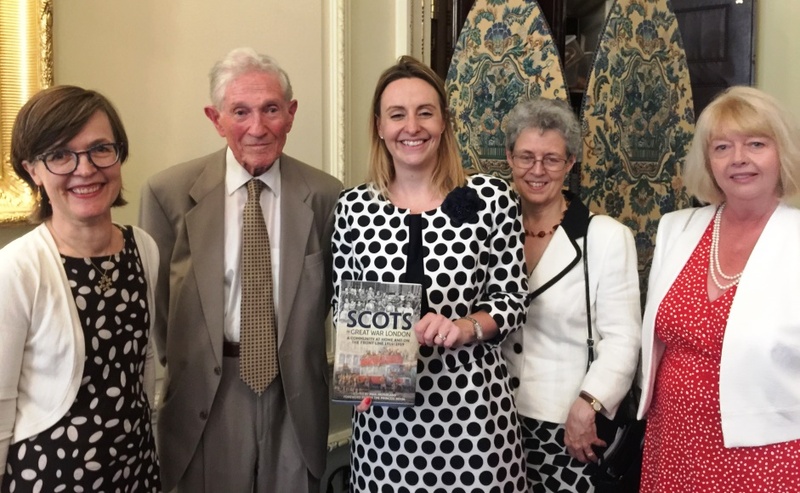 The support given to Scots in London by the 400 year-old Royal Scottish Corporation, now called ScotsCare, is also highlighted in the book. The Scots in Great War London Group comprises of: St Columba’s and Crown Court Church of Scotland , Caledonian Club, London Scottish FC, London Scottish Regiment, ScotsCare, Scots Guards, Royal Caledonian Education Trust, Caledonian Society and Burns Clubs of London.